I don't know if you've heard the news! Seems that Ikea is discontinuing their Expedit line. Run don't walk to pick up some pieces before their gone! We bought a few of their shelves last year to make my daughter's Platform Bed. With kids, you are always looking for more space in their rooms to hide their toys and stuff. With my oldest, it's books. She reads a ton and really fast too. I try and get most of her books from the library since she reads them so quickly. It's really not worth it to buy her them when she is done in a day. I have had luck finding books at garage sales and Goodwill. I like to buy her favorites that she will read again, like Harry Potter and American Girl books. So, she has accumulated a nice collection of books and we needed space to keep them all. 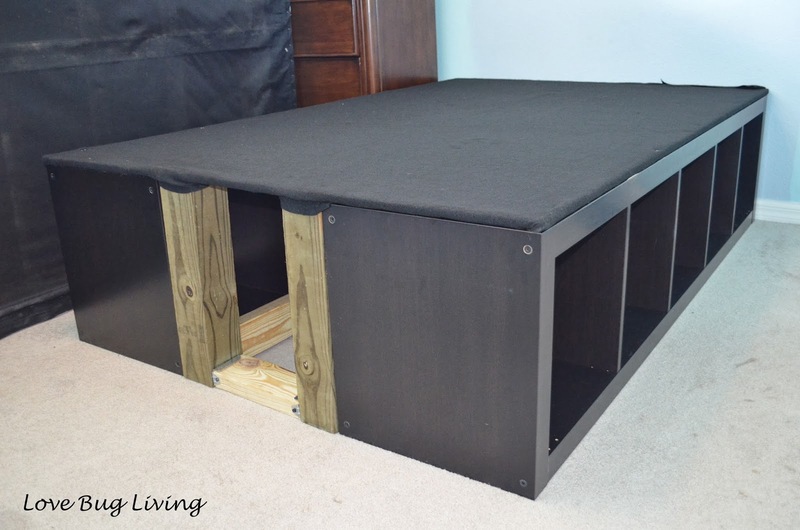 This Ikea Hack Platform Bed is the perfect way to add storage to a room without taking up more room. 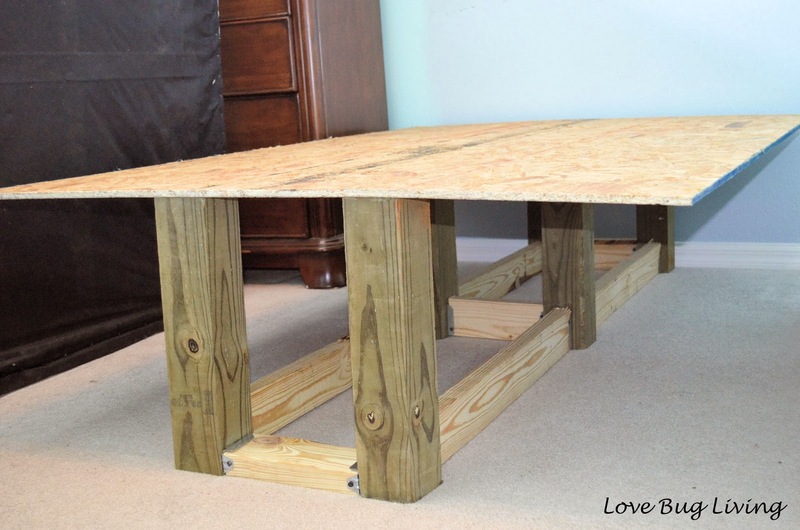 You will need a piece of plywood, 2 4x4s, 2 2x4s, T brackets, screws and nails. You will also need two Expedit bookcases. My husband began by building the base out of 4x4 posts and 2x4's to brace between them. The height of the 4x4 posts was just a bit taller than the bookcases that were going to be slid next to them. Cut a piece of plywood just an inch or two smaller than your mattress. 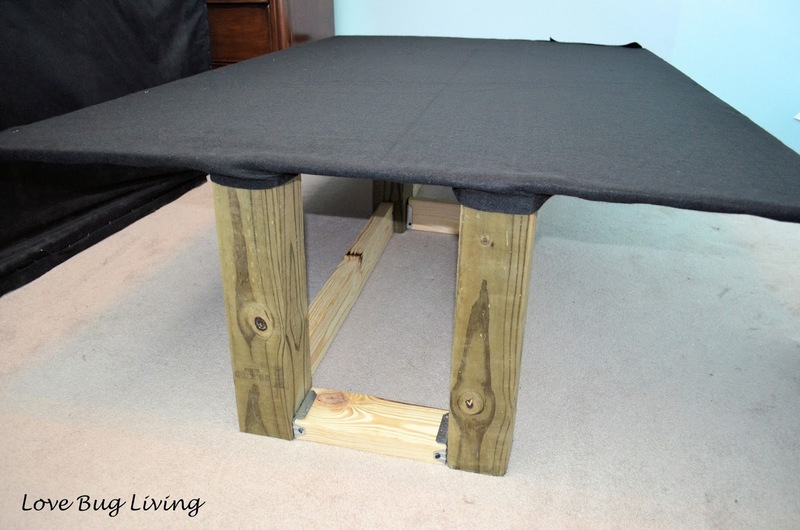 Center the plywood on top of your base and attach it with nails to your 4x4 posts. Here is a close up of the brackets he used to attach the 2x4 braces. After the base was complete, I wrapped black felt across the top of the plywood and wrapped it under to cover the bottom of the plywood as well. I used a staple gun to keep it in place. 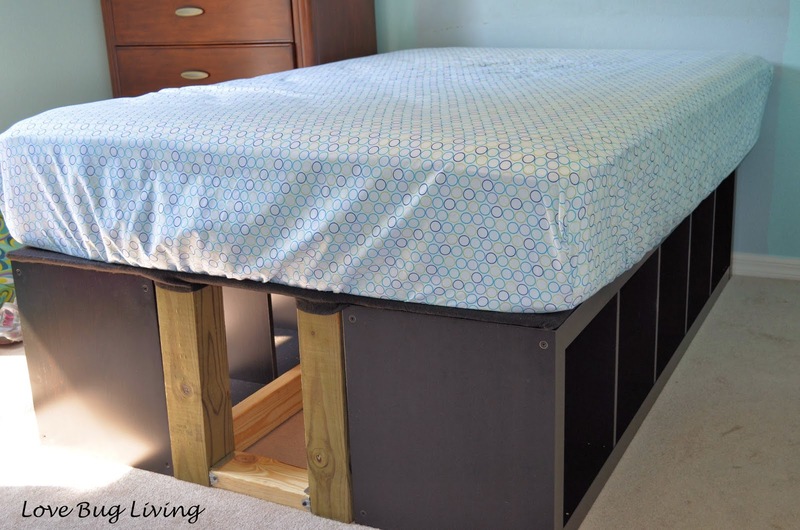 This will protect your mattress and also the bookcases you will slide under it. The next step is to simply slide your Expedit bookcases under your plywood. The base plus the bookcases really makes the bed quite sturdy. We used a full size mattress on our platform bed, but I'm sure you could adjust this to fit a queen or twin (with one bookcase) as well. The end of your bed will have this opening. You could paint the posts to match your bookcases, staple a piece of felt to cover the opening, or staple or drape a piece of cloth over the end to create a bed skirt kind of look. We actually wanted to use this extra space between the bookcases for more storage, so we added two small storage ottomans to make a bench at the end of the bed. We can easily drag them out of the way to get to her overnight bags and items she doesn't need too often. Hi Great Idea, what size bed is this? Twin or Queen? This is actually a full size bed. Great idea!!! Really, I did not know that they were discontinuing the Expedit. I will have to make an Ikea trip. For any who are wondering, Ikea isn't so much discontinuing Expedit as modifying it. To avoid confusion, they're calling the new version Kallax. Looks like that should still work for this wonderful hack. can we use any other type of bookcase for this idea? Ikea is adding a new line that is a modification of the old Expedit that I'm sure you could use. It's called Kallax and looks similar. I'm sure you could find another comparable bookcase somewhere else or even build your own. What do you think the weight limit would be on this bed? I have a son (85lbs and growing) that can really use this, but I don't know if he would outgrow it. What do you think? Most of the weight will be put on the 4x4 wood structure that is built. The shelves were just slid in underneath the plywood. There will be some pressure on them if someone is sitting on the edge. My husband is over 200 lbs and has laid on our daughter's bed. I think it would work for your son, but just make sure your base is strong and sturdy. Thanks and good luck! 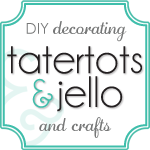 Hi, I just saw your post on pinterest and love your idea. Question - how long is your bed? My son's bed is 75 inches long, but the shelves are less than 60 inches tall according to the website. 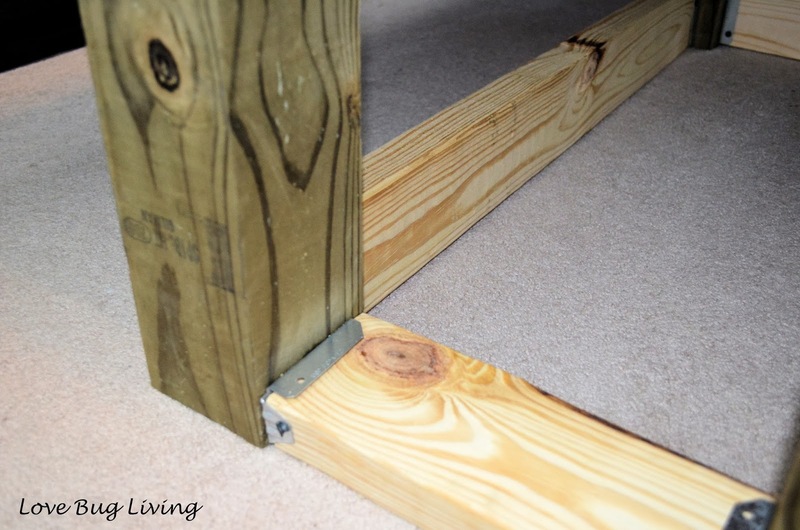 Did you add anything as a filler for the length of the bed? They changed their shelving units. The ones we have are 73 inches long, so I didn't have to add anything else. I would suggest either finding another shelving unit that you could use under the end of the bed. Or you could slide the shelves towards the end of the bed and use a couple of extra 4x4 posts to support the head of the bed. Good luck! May I ask how much your project cost? I'm a recent college grad about to move into a 7x10 room with a semi small budget. I believe we spent about $50 on wood and brackets, plus the cost of the shelving. Hope that helps! 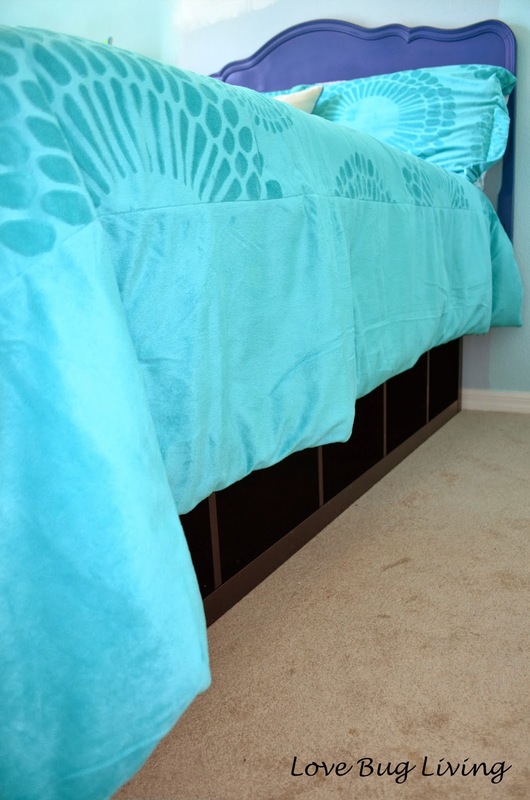 A bed frame is a key thing without what you can’t even think to place your mattress well. This single line is probably good enough to make you understand the importance of a mattress foundation or bed frame. Never use the cheap (quality) mattress foundation that will make your body full of ache every time you lie down. So, we think that choosing a good bed frame like the Zinus Platform Mattress Foundation is extremely necessary and effective. 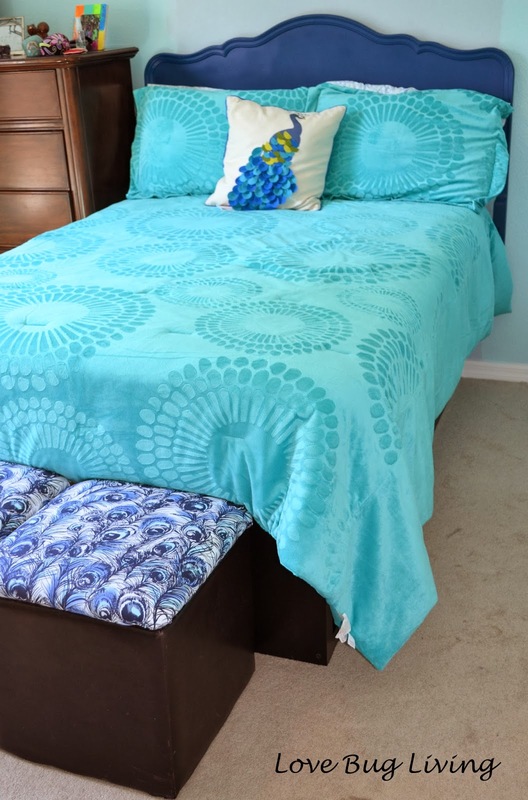 Cotton king bed sheets are ideal for every day use, whereas occasionally, you might want to move up to silk sheets. silk sheets king The second is the quality of the sheets. You can choose stairs also instead of a ladder. Kids are much fascinated about bunk beds, as they find it adventurous and beautiful. You can design the bed which compliments with the wall and the interior.